Return To Excellence: Had Enough? 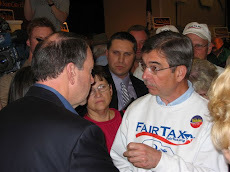 The recent series of messages re the contemptible way the Republican Party leaders recommended their candidate in PA's 12th Special Election race walk away from the FairTax is far too typical of the way both Democrat & Republican machines work - which is an excellent reason to bring in more parties as the two major ones play us for fools alternating between positions that really only benefit them @ our expense. Below is a piece written by congressional candidate Dave Corsi re some shabby treatment he received from the Republican machine in NJ's 12th district. 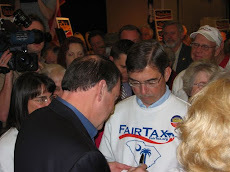 Dave's run for Congress started @ a FairTax meeting held around a kitchen table in south Jersey one Saturday afternoon in September 2007 that Carol & I were honored to attend. Dave is running his campaign around the words "Had Enough?" Please check out Lon Hosford in the 7th district and Anna Little in the 6th distrcit. If you do not vote in these districts please spread the word about these candidates to people who do. Dave, Lon, & Anna are the type of people we need in Congress - which is exactly why the machines of both major parties are doing everything they can to discourage them as indicated in the message from Dave below. The Marlboro Republican Club had scheduled an event for the Republican Congressional Candidates in the 12th and 6th Districts. In March I was invited to address the group. On Sunday I was "uninvited" as the Marlboro Republican Club "leaders" decided only to allow the "party line" candidate to speak. After a great idea from Charles Measley we decided to show up and hand out flyers. In the meantime the "leaders" apparently were not happy about our being there and called the police saying we were "causing a disturbance." The police officers who responded were terrific and determined we were doing nothing wrong. The thing that bothered me was the initial response officer, upon receiving the call that there was a "ruckus going on," rushed to the scene and almost had an accident. That officer could have been injured just because someone inside the building did not like the fact that we were outside handing out flyers and telling folks to have a nice evening. An interesting note was that some of the attendees going inside were not happy that I was being excluded (a good sign for us). All in all, Charles and I thought there were approximately 30 people who attended the event. We are 2 weeks from Primary Day, we are at "crunch time". These next 2 weeks will tell the story. If we work together, putting up signs, canvassing neighborhoods and talking to family and friends on June 8th we will make history. Vote For Dave in The Republican Primary Tuesday June 8th!